What’s Different in Apple’s Apps? 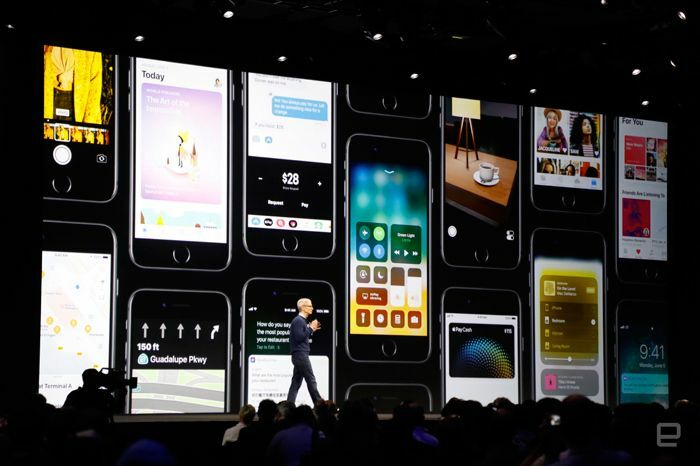 This year’s WWDC brought us one of the biggest events in the tech world. On June 5, 2017, Apple got everyone excited about all the new features and possibilities they revealed. The announcement of new devices was the center of attention: iPhone 8, iPhone X, and two versions of the new iPad Pro, as well as updates to the MacBook and MacBook Pro and WatchOS 4. But the biggest news was undoubtedly the release of iOS 11. 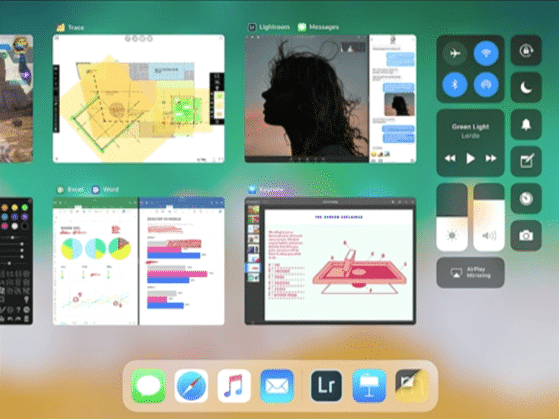 Apple had already released an iOS 11 preview for developers, but now almost all users of iPads (iPad Air, Air 2 and 5th-gen iPad, iPad Mini 2, 3, and 4 and all iPad Pros), iPods (iPod Touch 6th-gen) and iPhone 5 and higher are able to enjoy it. In this review, we’ll discuss what’s new in iOS 11: features that are meant to make the user experience smoother, more convenient, and more exciting. First of all, let’s talk about design changes. Fonts have gotten bolder. Apparently, Apple decided to step away from the thin and subtle fonts they’ve featured since iOS 7. Not everybody likes this idea, and there are lots of negative comments about it from users on the internet. The overall design reminds of iOS 10’s Apple News and Apple Music. The design of the new status bar is also different – the battery indicator now looks like what many people have missed since iOS 7. Icons in the Dock no longer have labels, but the font of other icons’ labels now shows more contrast and are larger. 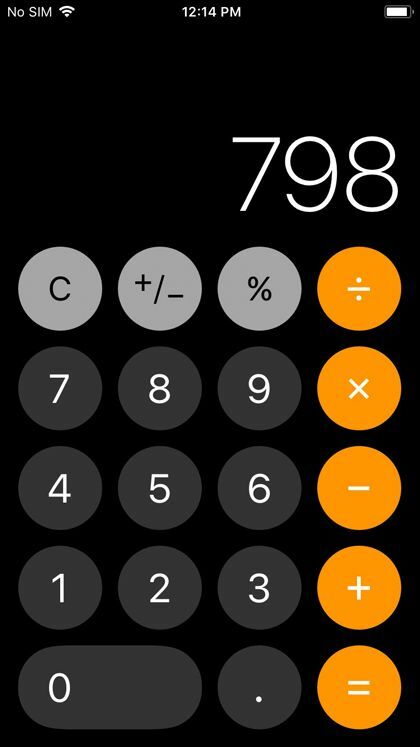 The App Store, iTunes Store, and Calculator have new icons, and the latter was completely redesigned with round buttons. We wouldn’t call the changes to the interface revolutionary like they were in iOS 7. However, the small improvements and tweaks certainly make a difference. 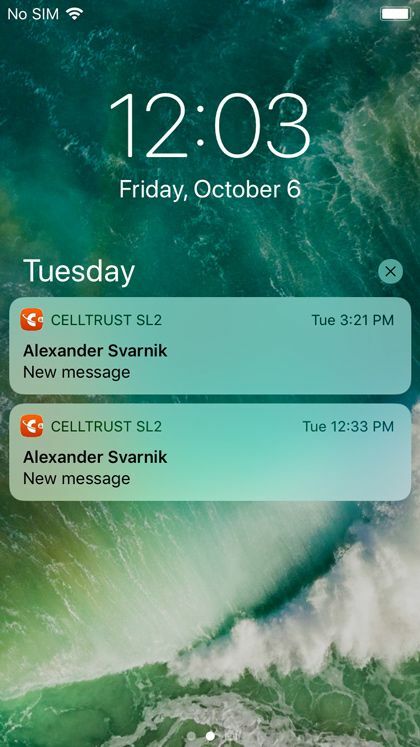 The lock screen has merged with the notifications screen in iOS 11. This was done to provide quicker access to notifications and a better user experience. Another new thing is the emergency call function that lets you make an emergency call by simply tapping on the lockscreen five times. The innovation within the control center was one of the most important and anticipated of all. Now you can actually customize it as you wish by adding buttons to the lower panel. You can customize your control panel on the Settings page, where you’ll find a familiar editing page that lets you remove elements with red minus icons and add them with green plus icons. The control center occupies an entire screen, which lets it fit more icons. The brightness and volume sliders have gotten bigger. 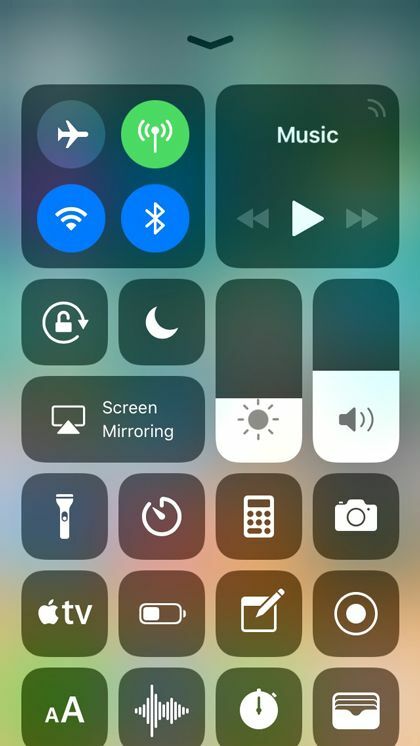 Separate sections for network options and Apple Music are on the top, and small icons are available for options like Do Not Disturb, Lock Rotation and others. Some icons show an additional menu if you long press. The control center is also different on iPads, bringing you an app switcher and an app dock. These two features are exclusive to the iPad. We’ll talk about them later. For now, let’s go further with discovering the new functions in iOS 11. The drag-and-drop feature was highly anticipated by users. Previously, only owners of Samsung Galaxy Note devices could boast having it, but now Apple users are no worse off. Drag-and-drop is an amazingly convenient feature that allows you to seamlessly exchange files between applications just by pressing and holding, then dragging a file to its destination. The renewed design and a few additional features make the new Apple Maps even more awesome. 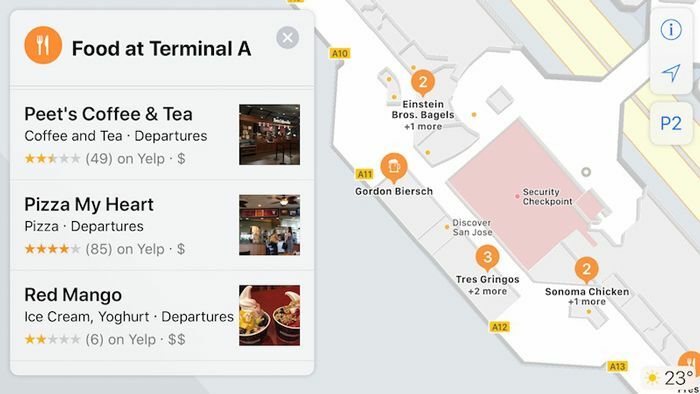 Now you can look inside buildings such as airports and malls so you don’t get lost. Another function will warn you when to change lanes before taking a turn when driving and will show you speed limits right on the screen. 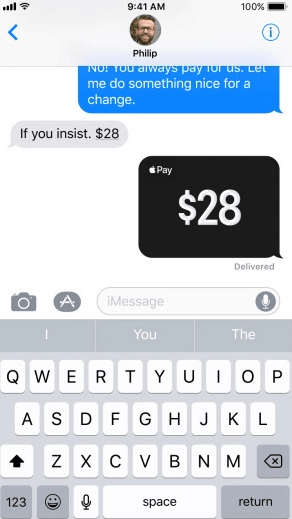 This is one of the best new functions in iOS 11, allowing users to seamlessly send money through iMessage using their Apple Pay accounts. 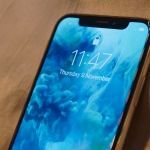 However, not all devices will get this ability – only iPhone SE, iPhone 6 or later, iPad Pro, iPad 5th generation, iPad Air 2, iPad Mini 3 or later, and Apple Watch. In addition, this function is so far only available in the US. 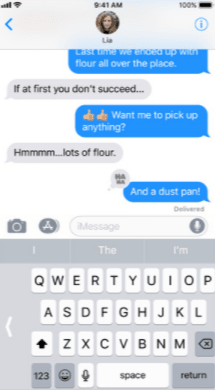 iMessage has also became more convenient on the whole, with improvements such as storing message history in iCloud so you can access it from all your Apple devices. There are also some additional options for your message design called Echo and Spotlight. Echo multiplies your message and spreads it all over the screen, while Spotlight highlights your message with a light circle and makes everything else dark. 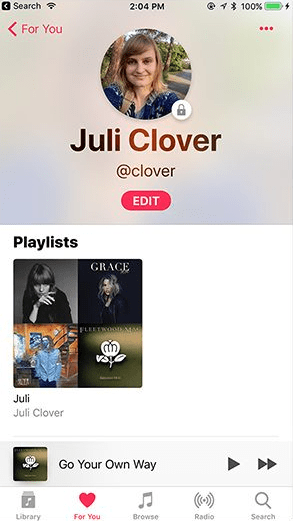 In the updated Apple Music you can see your friends’ profiles and playlists and share your favorite music with them. 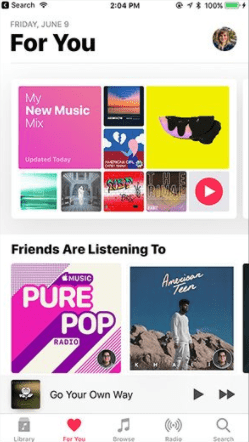 There’s also been a slight redesign of Apple Music. Apple News has become smarter, and now it will select news just for you based on your Safari usage. You’ll be able to find recommendations in the For You section. 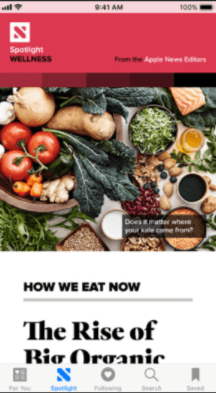 Another section called Spotlight will feature news picked by Apple News editorial staff, and promises to become more personalized and engaging. 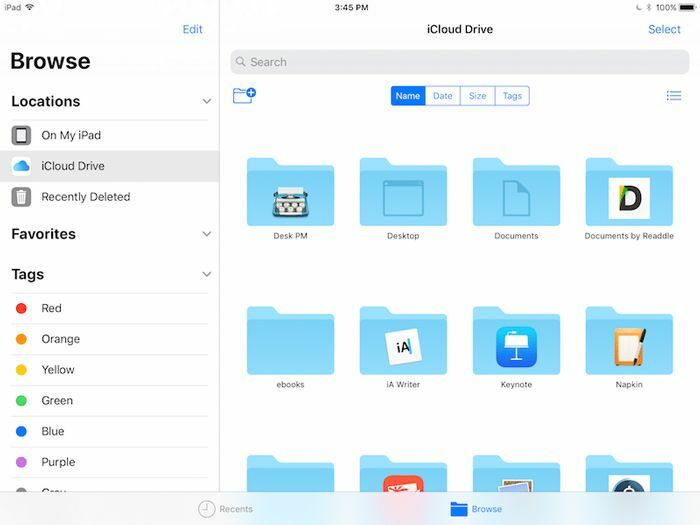 Instead of iCloud Drive, you’ll be able to enjoy a new application called Files. It’s mostly like the Finder on macOS. Files gives you access to all your documents and files from iCloud and can connect to your Dropbox, Box, OneDrive, and Google Drive accounts. A few new items have appeared in the settings. In the Accounts & Passwords menu you can now find your logins and passwords. But don’t worry – they’re protected by Touch ID. If you unlock them, you can edit them or just look through them. The Storage menu is also a bit different. It now has a scale that shows the percentage of your storage occupied by software, media files, books, and emails. Here you can also find recommendations for how to clean up space in a few different ways. One way is to temporarily delete some apps. If you do, all app settings are saved so you can restore the programs fully any time you want. Live Photos has gotten three new effects: you can play them in reverse, make looped videos, and imitate a reflex camera with Long Exposure. The camera also has new filters and can compress files to make them smaller and thus save storage space. The camera can also remember your preferred shooting mode to use it in the future. And it’s a bit late, but in the new iOS we finally have a QR code scanner. Overall, the quality of photos has improved, even in low-light environments. Portrait mode allows flash and supports HDR for better lighting. You can even take a photo during a FaceTime chat. As you probably remember, facial recognition in Photos was exclusive to each iOS or Mac device. In iOS 11, facial recognition will sync across all of them. 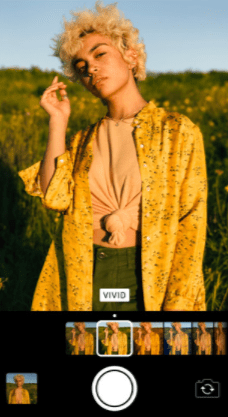 Machine learning is now used in Photos too, particularly to generate automatically composed slideshows called Memories. The machine learning algorithms can also detect the device’s orientation and put a slideshow in either landscape or portrait. Safari is also becoming smarter – it’s now integrated with Siri. Safari lets Siri know more about you so Siri can give you a more personalized experience. Safari will now be able to predict what you might type or what kind of news you’re interested in, which information will be used by Apple News. In addition, Safari’s new feature will help to protect you from advertisers gathering too much data about you. Of course, you’ll still see ads in your browser, but your personal data will be more secure. The Dock has been around since the first iPhone, but in iOS 11 it has changed very much. Not only is it now customizable, it also features a drag-and-drop function that we’ll talk about later. It also includes smart elements and can be accessed from anywhere with a short swipe on any edge of the screen. 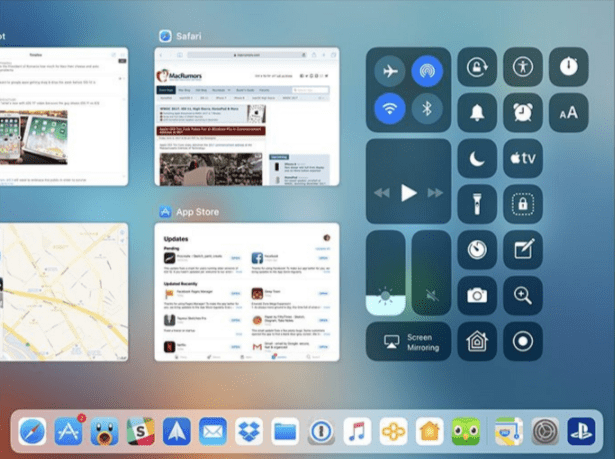 The app switcher has mostly gone unchanged, but now it’s placed in the control center, where you can see screenshots of apps you’ve recently used. 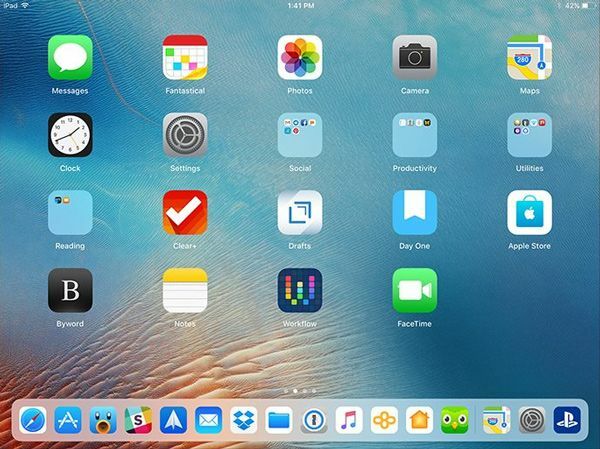 These apps are also more easily accessible – first of all, they’re located in two rows and you don’t have to double-press the Home button to see them. Secondly, you can just swipe to the right to see earlier apps. But there’s also a bad thing, or at least a thing that many users may find inconvenient: a swipe up is no longer enough to close an app. You now have to press and hold until an X icon appears, then tap it. As you can imagine, this takes too much time. With flicks, you can enter numbers and symbols without the shift key. This makes typing easier and faster on all iPads except for the 12.9-inch iPad Pro, which uses a different system for accessing extra keys. Just hold down on a key and enter a number instead of a letter – it’s that simple. 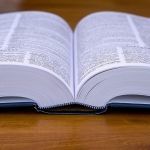 Moreover, there’s also a small but pleasant addition to the keyboard – you can shift it to the left or to the right to be able to type with one hand. In iOS 11, Apple Pencil can be used across the whole OS, not only in a few apps as previously. Basically, it can replace a finger or a stylus if you want, which makes the next function possible: Instant Markup. If you were looking forward to drawing all across your device, these three features are what you’ve been waiting for. 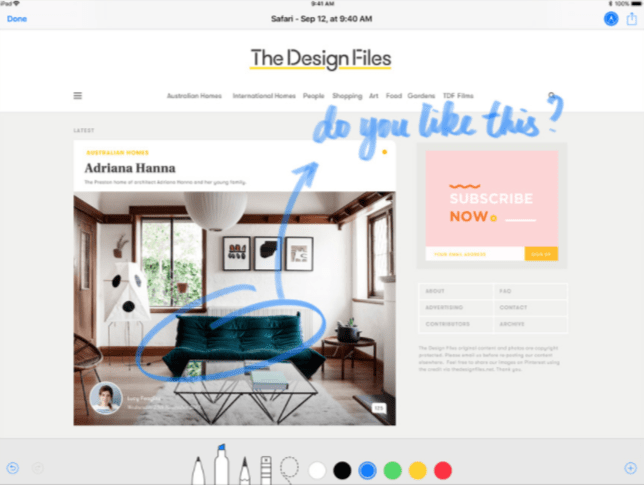 With Apple Pencil, you can now take screenshots and then use drawing tools to highlight something or draw on them. Another feature called Markup Through PDF will allow you to draw or write on documents with your Apple Pen. In fact, you don’t even need an Apple Pen to do it – a finger works just as well. Inline drawing will allow you to add drawings right to an email or a note. Instant Notes are opened with a tap of the Apple Pencil on the lock screen. After that, you’ll immediately be able to start a notes document. Every iOS version brings us a more intelligent and human-like Siri. This year, Siri got multiple improvements due to machine learning and artificial intelligence. Siri’s voice has also become more natural and expressive with better pronunciation and inflections, and her answers have become more coherent. By the way, Apple is now working on making Siri more compassionate when asked certain questions about psychological states or life problems. Maybe in some months or years, we’ll get a more emotionally intelligent and empathic Siri. But for now, Siri’s achievements are still very impressive. As we mentioned earlier, it’s now integrated with Safari. This will let her know more about you and your preferences. 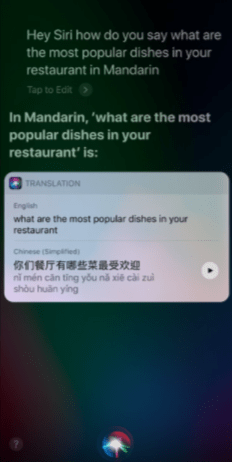 One of the biggest new things Siri now can do is translate into Chinese, French, German, Italian, and Spanish. And now you can also type your questions or requests to Siri if speaking aloud isn’t an option. Apple has totally redesigned its App Store. Apart from the renewed design in a more minimalist style, the App Store’s structure has changed. There’s a new Search interface and Purchase screen as well as new app pages. 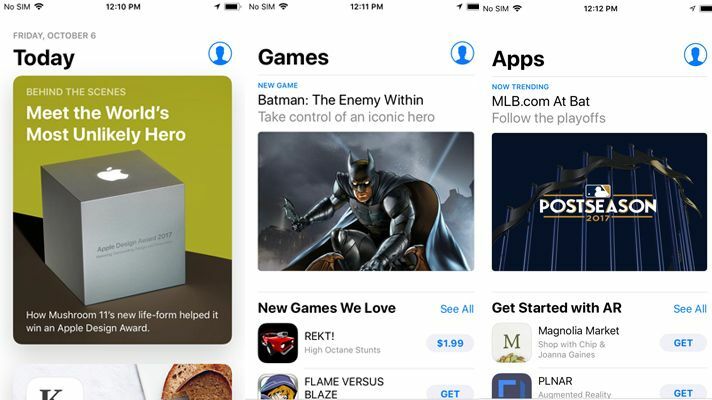 Games and Apps are now two separate pages, and a new Today section features articles and compilations from Apple’s editorial staff. There you can also find the App of the Day and Game of the Day along with app tutorials and other useful stuff. Individual app pages are now focused more on reviews and video overviews. Users can get a notification when new features appear in an app. A new interesting feature that’s currently very popular in China is guidelines with tips on using an app, which is a way to monetize apps. On the whole, there are more options for leaving reviews. Now users can leave reviews without leaving an application. This new function is there to protect drivers from being distracted on the road. Talking on the phone or replying to a message while driving can cause accidents, and Apple is aiming to prevent them with iOS 11. The Do Not Disturb function will turn on automatically if you connect to your car’s Wi-Fi or Bluetooth network. 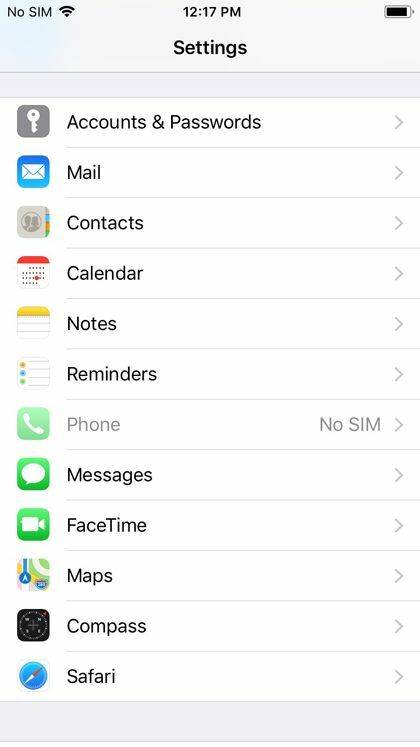 iOS won’t send you any notifications except for emergency messages while you’re driving. Moreover, it will notify any person trying to reach you that you’re currently driving and can’t answer. You can easily turn this function off if you’re a passenger in the car. And of course you can disable it completely if you don’t want to use it. The ARKit API is one of the best tools for developers and has so many possible uses! 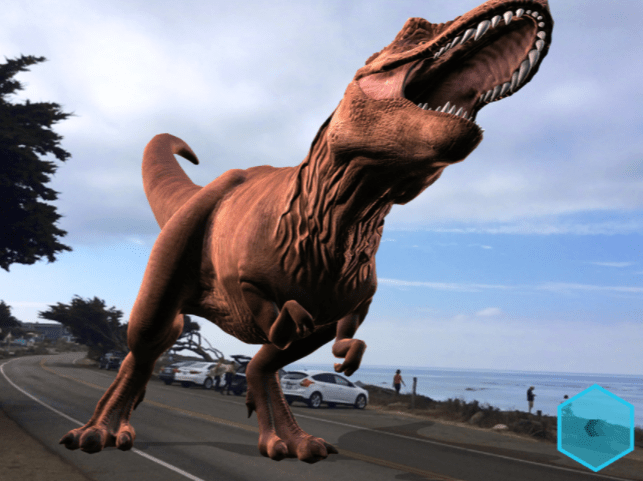 With this tool, developers will be able to build AR apps that place virtual objects into the real world. There are already lots of demos and even ready-to-use apps for all spheres from gaming to medicine. This API is useful for camera applications. With the Depth Map API, developers will be able to create new photo editing tools that will be fun and original due to the depth photo technology. Now there’s no need for approval from Apple to begin working with HomeKit. Developers will be able to create products and test them before getting them to market. Developers can build Apple Music, iCloud Music Library and other music-related products right into their apps. Developers now have the possibility to build more intelligent applications with this machine learning framework. Text, object, and face detection along with deep neural networks are now available to developers. This is a framework that enables apps to read NFC tags. When holding an iPhone near a tag, a “Ready To Scan” dialog will appear. 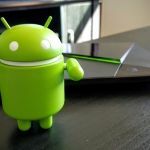 With this framework, developers will be able to use NFC tags in their apps. Knowing more about products or items at an exhibition or a store – the possibilities for NFC chips are immense. 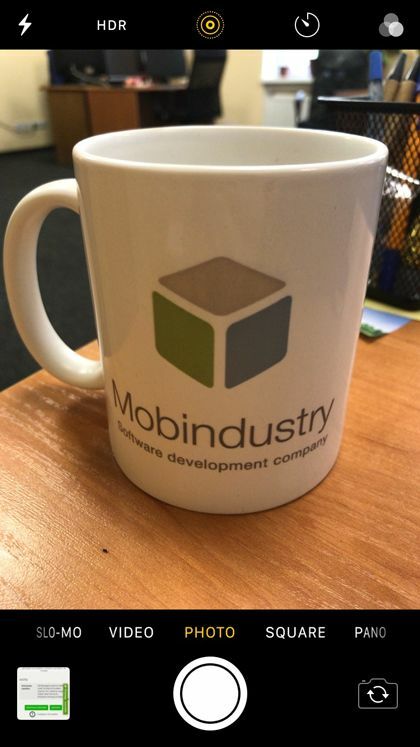 The main language for developers has also changed a bit. Now it’s Swift 4. The main changes from Swift 3 are new functionality and more intuitive and convenient methods and instruments. The migration from Swift 3 to Swift 4 won’t be a problem at all, because there aren’t any fundamental changes, but working in Swift 4 will definitely be easier. Whew! We’ve covered all the best new features in iOS 11, and now we can finally make an iOS 11 vs iOS 10 comparison. In the table below, we compare some features in iOS 10 and iOS 11. Of course, this chart doesn’t cover all the differences between iOS 10 and iOS 11. 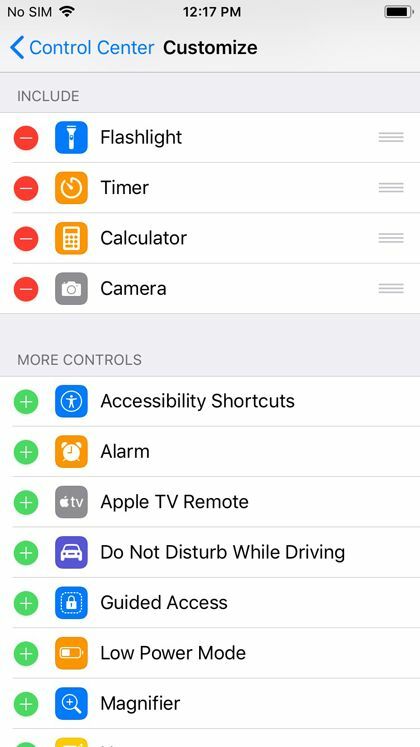 There are also all those new features in iOS 11 we mentioned before like drag-and-drop, camera functions, Do Not Disturb while driving and new map features. Moreover, all new tools for developers will soon make an even greater difference in new apps. Most feature changes between iOS 11 and iOS 10 aren’t revolutionary, but they’ll surely make the user experience smoother and faster. 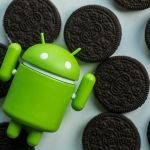 Some new features give users more power over their devices and let them customize and individualize them. 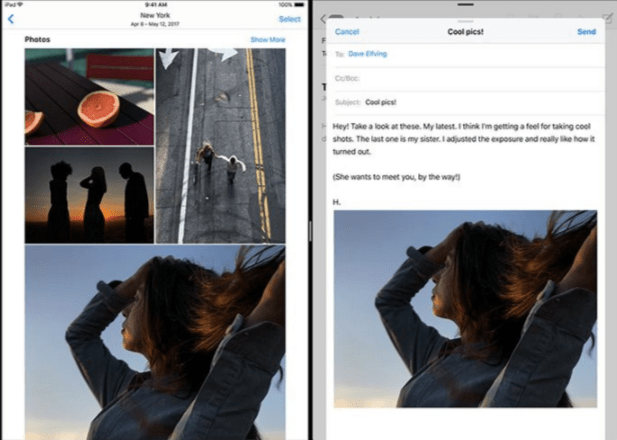 Tools for creating and editing notes and photos look like a lot of fun, and we’re sure that they’ll become popular among users. The only thing many users don’t like is the design changes. Fine and thin minimalist design has been Apple’s calling card, and not everybody likes the new tendency to make the design heavy and bold. Moreover, now most users are unsatisfied with the performance of iOS 11. Just after updating, many users started facing problems with the new OS. The latest news about iOS 11 is full of complaints – things were working slower and some apps wouldn’t stop crashing. However, it’s always like this with a new OS, and in October Apple put out a second minor update – 11.0.2 – which works much better. In time, Apple will surely fix all the problems and with a few more updates the OS will work perfectly. Weighing the pros and cons, we think that there are definitely more advantages in iOS 11.